We typically hear from our supervisors when a) we screw up, b) we execute an assignment perfectly, or c) we get called in for a performance review. But getting honest input from our supervisors can enhance our relationship, reduce stress, and advance our careers. Here are a few key questions you can ask that will help you establish good rapport. When to ask: Monday mornings are often hectic, but it’s a good time to ask about your supervisor’s weekend and connect on a non-work level. Why it’s important to ask: The more you know about your supervisor, the better. Appearing mature and invested in your relationship generally scores points with management. 2. What’s the biggest problem you are facing, and how can I help you solve it? When to ask: When you’re new to a job or team, or when a new supervisor joins your department. Why it’s important to ask: It shows that you’re strategic, thoughtful, and that you take initiative rather than waiting for someone to tell you what to do. 3. Why do the best employees who have worked for you stand out? When to ask: Save this question for when you’re in a performance review or when you’ve gotten critical feedback. Why it’s important to ask: This is a great way to discover what your supervisor values most, and you can try to emulate some of the traits your supervisor shares with you. 4. Would it be possible to get some feedback from you during the project? When to ask: Anytime you start a new project, work with a new team, or work on a long-term assignment. Why it’s important to ask: The best way to get meaningful input is to ask for it before you need it. 5. Are there any similar projects I should review, or people I should speak with, before I begin? Why it’s important to ask: By asking for guidance ahead of time, you could spare yourself, and your supervisor, from disappointment and wasted time. 6. Would you be receptive to my taking on some new challenges in the next 6 months? When to ask: When you’re excelling in your current role and you’re ready to take the next step. Why it’s important to ask: Managers love employees who are enthusiastic about to learning, growing, and taking on new responsibilities. 7. What should I start doing, stop doing, and continue doing? When to ask: During your performance review, but if you forget, ask your supervisor a quick, one-on-one chat. Why it’s important to ask: Your supervisor likely loves some things you do and dislikes others. If you ask, it shows that you’re eager to do a better job. 8. Could we schedule a follow-up conversation at a date in the future? When to ask: At the end of a not-so-great performance review or whenever you receive less than positive feedback. Why it’s important to ask: It’s hard to think on your feet and ask constructive questions when your work has been criticized. Asking for a few days to collect your thoughts will likely make your conversation more productive. 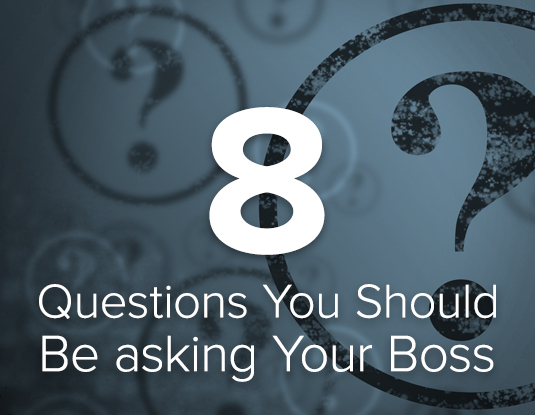 Based on 8 Questions To Ask Your Boss That Can Make Or Break Your Career by Celia Shatzman.